Vivid Sydney is an annual creative festival of light, music and ideas that each night transforms Sydney Harbour and its iconic architecture and public spaces into a canvas for spectacular light installations. This year, designers and artists from Australia and around the world have created 60 installations, including four HASSELL-supported works that feature in the Walsh Bay precinct – the location of the newly-opened HASSELL studio. 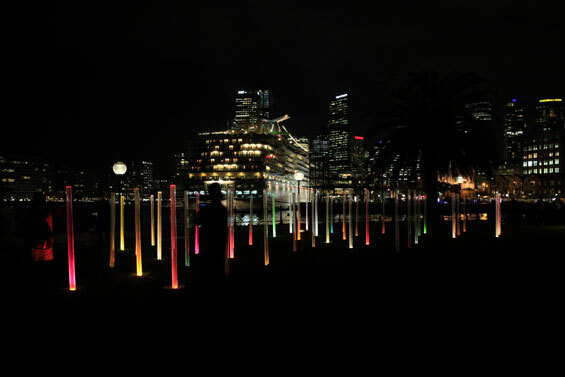 Individuals from HASSELL have participated regularly in Vivid Sydney, but this year involvement has been taken to a new level for the fantastic opportunity to engage with the wider creative community of Walsh Bay. “One of the key reasons for moving to the precinct is the other creative firms that exist here. Whether it’s dance, theatre, music, or the range of designers – it underpins who we are and what we’re about. 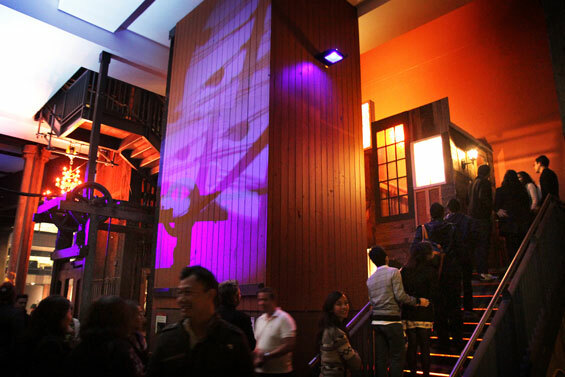 Traditionally Vivid has been focused on the Opera House and Circular Quay. Coincidentally and wonderfully, this year it terminates at our new locale on Pier 8/9 Walsh Bay,” said Angus Bruce, Head of Landscape Architecture at HASSELL. 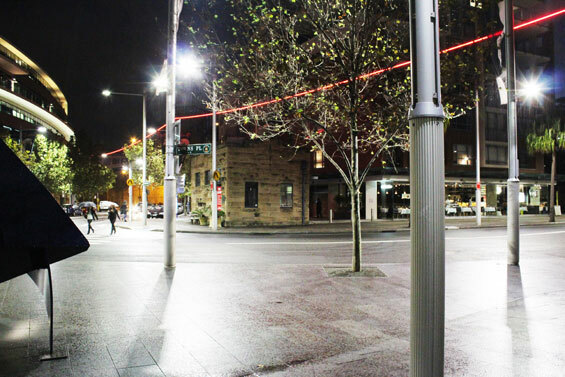 The Dalgety Line is a site-specific installation, that seeks to reconnect the city and the harbour, responding to the historical position of two assets of the Dalgety company (a wharf and a wool store), as well as a 2012 proposal to split the Millers Point area into two suburbs, disconnecting the hillside settlement from the waterfront. 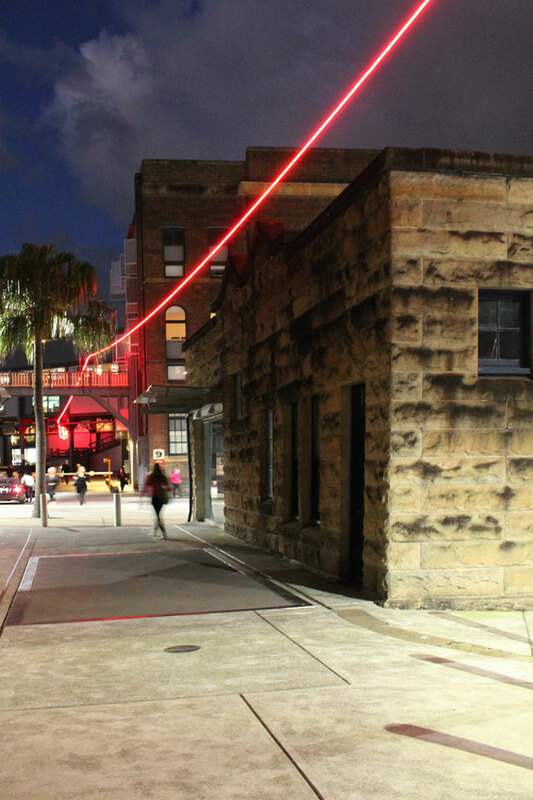 The line reconnects Millers Point with its historic waterfront conceptually and literally. 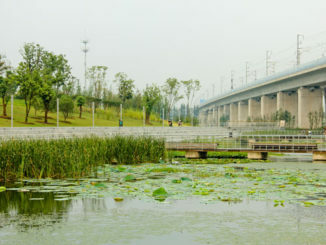 It runs across Hickson Road, suspended above the ground and tethered sensitively to buildings and urban elements. Marking the western threshold of the Vivid festival, the line also creates a sense of arrival or departure for people passing beneath it. 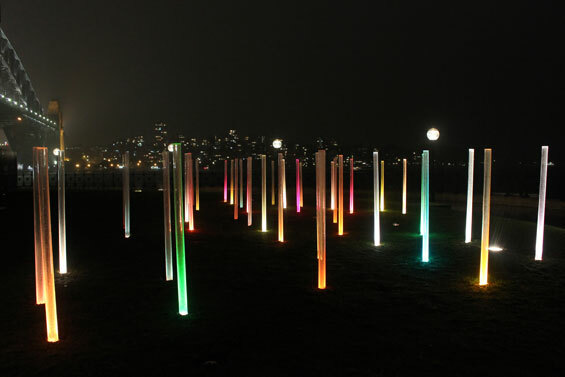 Field of Colour is a series of illuminated coloured tube clusters. Each cluster has the same geometry and spacing, except that each is rotated in a slightly different way. The installation, intentionally quiet and calm, accentuates the arresting views from the site. Its abstract nature allows people to appreciate and interpret the piece in their own way. Rats references the rodent invasion that took place in the Walsh Bay area in 1900, resulting in an outbreak of bubonic plague. A quarantine program followed as the Sydney Harbour Trust demolished all existing buildings in the area and created a new rat-proof sea wall to stop further breeding. The invasion of rats can be seen as the single most defining factor to shape the area’s development. 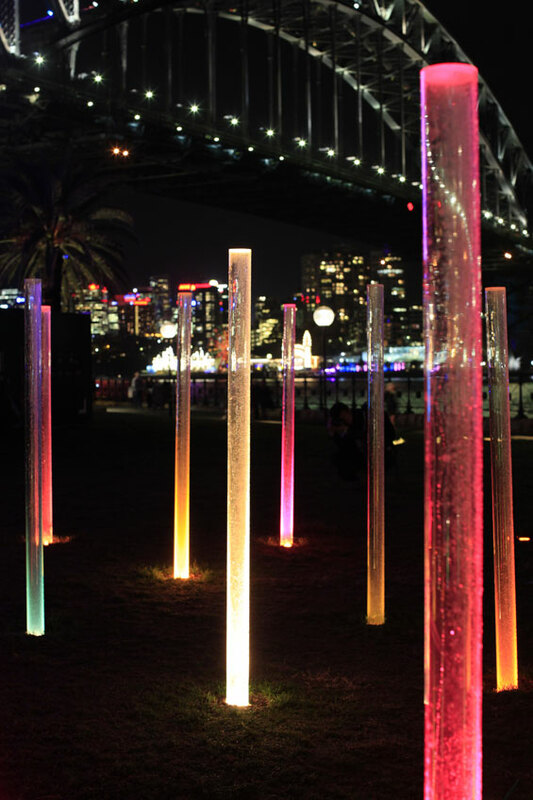 This idea inspired the design team to create the random effect of rats floating the water of Pier 8/9 in Walsh Bay. 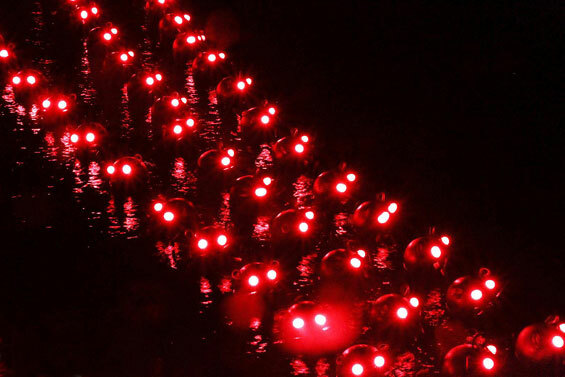 The invading rats, crafted completely out of material associated with the sea, stare out en masse from the dark night waters evoking an eerie feeling. Walsh Bay Whispers looks to the Walsh Bay Wharves and the significant role they played in Sydney’s founding history. The wharves were hubs for settlers, traders and travellers, each with their own colourful tale to tell. 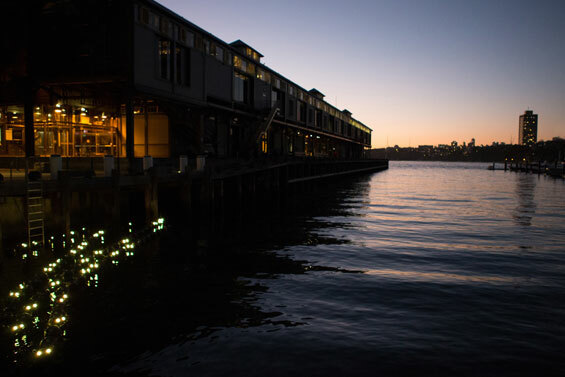 The installation aims to bring those stories back to life, capturing the essence of this era when the wharves were first built and the area was a bustling centre of Sydney. Using light and an emotive soundscape by David Pickvance to inspire the imagination, Whispers is an immersive experience of discovery and delight where nothing is as it seems. 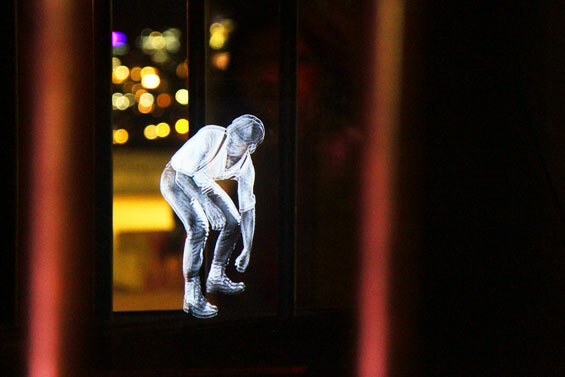 With ghost illusions housed in an environment of historic elements, including reclaimed heritage doors and windows and custom designed chandelier, the installation evokes the richness of Sydney’s past.